Unlike the Total Return approach where you have one large portfolio in charge of funding all ongoing retirement expenses, the Time Segmentation approach (aka “Bucket Approach”) breaks your spending goals into a series of time periods. Assets are set aside and invested for each time period. 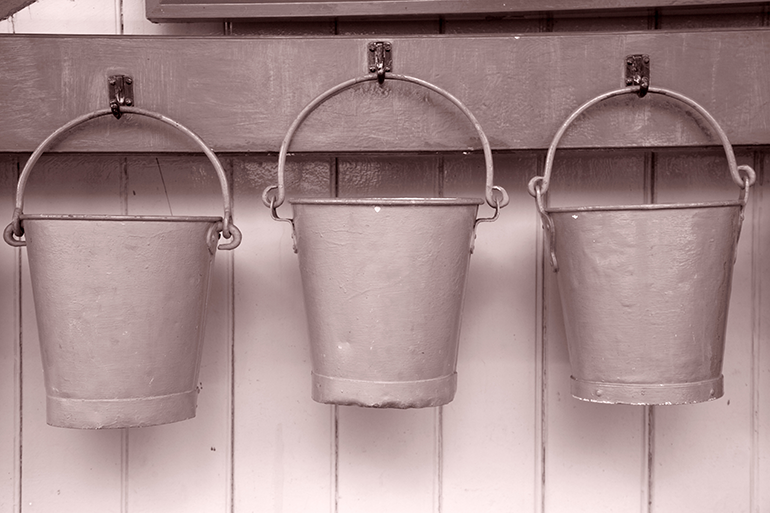 Sometimes this is referred to as a ‘bucket approach” since it is easier to visualize a series of buckets, each holding assets to fund a series of retirement expenses. Ages 60-70: You may want to do a lot of traveling or other activities. Money is set aside for that time period (bucket 1) and invested to meet these shorter-term goals and time horizon. Ages 70-80: Maybe traveling is tapering off, but there are more medical expenses. These are more intermediate goals as they are 10 years into the future. This 2nd bucket can be invested a little differently than the 1st bucket because of the time horizon. Ages 80+: You may not know what to expect 20+ years into the future, but you know you don’t want to run out of money. Medical expenses may be up, but overall spending may be lower than past time periods. The 3rd bucket has a long-term time horizon and can be invested as such. Each bucket has its own specific goals, time horizon, and portfolio associated with it. The 1st bucket, with its short time horizon, will usually only hold money markets, CDs, bonds. The 2nd bucket will be a mix of bonds and stocks. The 3rd bucket will usually consist of mostly stocks, since it’s very long-term in nature. This approach can be appealing because it can insulate you from whatever is going on in the market. If the stock market is going down, bucket 1 shouldn’t be affected since you have your 10 years of income locked up. Bucket 3 may be down, but there’s comfort in knowing you won’t need those assets for 20+ years. This approach is really about framing and presentation. There is no research that shows you can create more sustainable retirement income with buckets than with having one large portfolio (Total Return approach) and having the same allocation. The overall allocation of the three buckets combined might be 50% in stock and 50% in bonds and it would look very similar to a 50% stock, 50% bond Total Return portfolio. The assets will pretty much generate the same returns from the same stock and bond markets. Time Segmentation just presents a solution that is easier to understand because you can mentally account for the different buckets. May lead to a false sense of security. There’s a certain comfort to Time Segmentation, but it’s not a set-it-and-forget-it approach. Over time you will need to move money from the 2nd bucket to the first, and from the 3rd bucket to the 2nd. But what if market conditions are unfavorable when you need to make an adjustment? You may need to make some tough choice on what you sell or “mentally move” to the next bucket. The overall portfolio allocation can change dramatically. As you use up the 1st bucket (filled with mainly CDs and bonds), your overall stock allocation will increase. You’re 50-50 overall portfolio allocation may spike to 70% - 75% stocks by the time you replenish the 1st bucket. That may be a good thing or a bad thing, depending on how the market is moving. Either way, it introduces an element of risk. You can prevent a soaring stock allocation by frequently monitoring your 2nd and 3rd buckets and seeing if it’s a good time to harvest gains and rebalance the buckets. That starts to sound a lot like a Total Return approach though. Easier said than done. On paper or in a diagram, the approach sounds easy enough. However, implementation can be tedious. Usually people like to consolidate accounts for easier management, but Time Segmentation may require you to split your assets into more accounts. If you had 4 accounts (2 IRAs, 1 Roth IRA, and a taxable account), you may need to split those into 8 or more accounts in order to create the right amount of assets for each bucket. Taxes need to be considered as well. You may not want bucket 1 funded by just an IRA as all withdrawals would be taxed as ordinary income. Mixing in a Roth IRA or taxable account would help reduce the tax burden of the withdrawals, but you may need to have more accounts. An alternative would be to keep your accounts consolidated and keep track of everything via spreadsheet. No guarantees. Just like with the Total Return approach, there are no guarantees that the stock market will perform the way you hope over the next 10 – 20 years. This approach can almost guarantee funding of short-term retirement expenses, but the longer-term is still unknown.